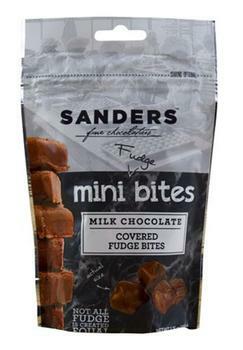 Sanders is recalling its Milk Chocolate Covered Fudge Mini Bites that may contain contain almonds, an allergen not declared on the label. The recalled 3.75oz Milk Chocolate Covered Fudge Mini Bites were distributed throughout several Michigan retail stores. The recalled product comes in a 3.75-oz.,, gray and black package marked with lot 8109 FL and Best By Date January 31, 2019 ink-jetted on the rear, and was sold in retail stores throughout Michigan. Customers who purchased the recalled product should contact Sanders at (800) 651-7263 Monday – Friday, 8:30 – 5:00 (EST) or by email at info@sanderscandy.com for a full refund or a replacement product of equal value.